Thus, it is very important that you as a genealogist and family historian learn that in order to find records about our ancestors you need to know where to look for such records. In order to find these places, you need to research the various political jurisdictions of where your ancestors lived. As an example, in this post, I will talk about my own research so you can fully understand how political boundaries affect the historical record process creation for our ancestors. But, before I dive into my own example lets talk about the various political jurisdictions you need to know about. These are the political jurisdictions that I have come across in my research. Now, let’s keep in mind that my family came from Rancho El Arcabuz located in Northern Mexico in the State of Tamaulipas. Also, keep in mind that no matter where in Mexico your family came from this post applies to them. Also, use my example and apply the methodology to your own research. This is the name the Spanish gave all of their newly discovered land in North and South America. You can find records for all of this territory in the Archivo de Indias in Spain and the Mexican National Archives. Many of the Archivo de Indias collections have been digitized and the ones for the Mexican National Archives have not. Within Las Indias, this is the name that was given to the territory that later was to become Mexico and the South West United States. Records for this area can be found at FamilySearch, Mexican National Archives, Archivos de Indias, and local State Archives. The Map below shows what was considered as New Spain. Then within New Spain, we find various kingdoms such as the Reino de Nueva Galicia, El Reino de Leon, and others. We also find provinces as Nuevo Santander, Coahuila, and Texas. All of them with their own jurisdictions and governments. All of which had to create and preserve records. The above map shows the various political divisions of New Spain and their capitals. These capitals are where you want to look for records. 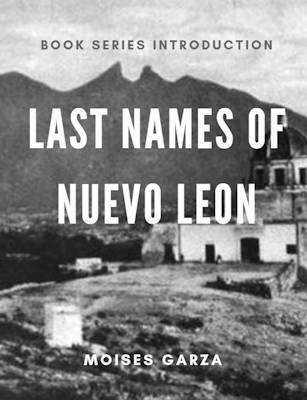 An example is that of Nuevo Leon, its capital Monterrey has published online all of their records spanning from the 1590’s to the present. You can browse those records here: The Historical Archives of Monterrey are Now Online. These records cover the News Spain colonial period and the current Mexican State time periods. 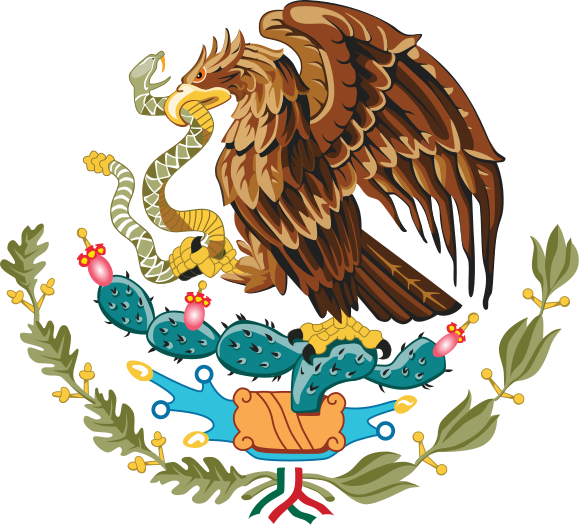 With Mexican Independence came the creation of States. 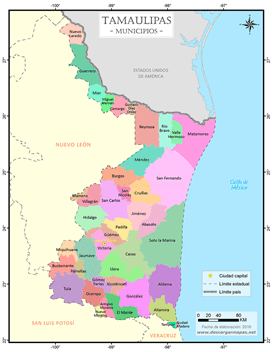 El Nuevo Reino de Leon became Nuevo Leon and el Nuevo Santander became Tamaulipas. The study of this period, especially the name changes of territories, provinces, and kingdoms will help you know where to further look for records. 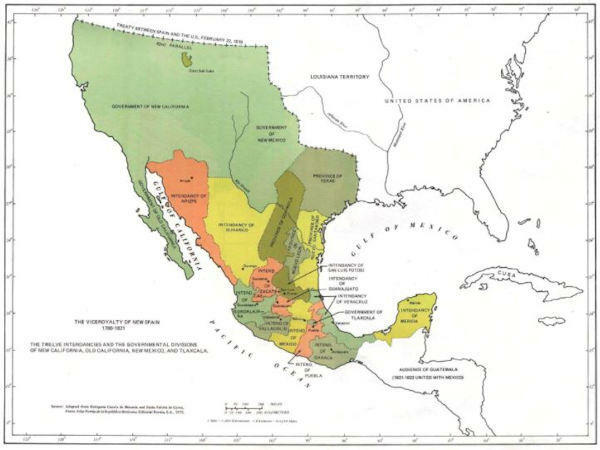 Below is the 1824 map of the Republic of Mexico. Once you find out what Mexican state your ancestors came from or lived at, make sure to read up on the history of the state. A good book will tell you what province or kingdom it used to belong to. It will also tell you what year the state was created. This is important since that is the date that the archives for that particular state got started and prior to that date you need to look at archives of the jurisdiction it used to belong to. Records for states can be found at the local state archives housed in the capital of the state. Keep in mind, records created before the state was created will be found elsewhere. State archives contain copies of birth, death, and marriage records from every municipality. At least that is the case for Tamaulipas. You also have to study the municipalities that your ancestors lived at and or came from. Municipalities are political jurisdictions equal to counties in the United States. The Mexican state is broken down into municipalities. Here is an example of the state of Tamaulipas and it’s municipalities. Keep in mind that municipalities were created in different time periods. For example, if the particular municipality was created in 1860 it means that your ancestors lived in another municipality prior to that. That is why it is also important that you find state maps that are twenty years apart. That way you will know where to look for records. Google the municipality, most have websites and or search for them in Wikipedia. Record’s for municipalities will be kept at the town that heads the municipality. It is usually the largest town that is located in the municipality. These records include birth, death, marriage, divorce, and land records. Some censuses will also be available. At the end of each year, the official in charge of the Civil registration office would make a true and correct copy of the vital books and send a copy to the State. The original copies of these books may be found at the local Civil Registration office. Make sure to read my example below to see what I found researching my own ancestors Government political jurisdictions. But, first, make sure to read our next part in regards to church Political Jurisdictions. Just as the government has it’s own political jurisdictions so did the Catholic church. Now if you belong to another religion don’t get offended that I am leaving it out but it is a fact that the Catholic Church was the main church of New Spain, its territories, and nowadays Mexico. Also if you are new to genealogy then you have yet to learn that almost all of your ancestors were Catholic and we as researchers are lucky that the Catholic church keeps great records. Now to let’s talk about the Church’s political jurisdictions that I have come across in my research. The church has divided Mexico into provinces since it’s colonial times to current times. One of it’s oldest is that of Guadalajara and at one point it used to control El Nuevo Reino de Leon, el Nuevo Santander, and the provinces of Coahuila and Tejas. Of course, as time went by it started to be broken down into smaller regions as new Ecclesiastical Provinces were created. An example of this is the Archdiocese of Monterrey which was created in the 1770’s and when it came into existence it took a big chunk away from the Archdiocese of Guadalajara. At first glance, this date may not seem important but it is. If you are looking for a marriage dispensation prior to this date and you are searching in Monterrey then you are wasting your time. You should be looking for it in Guadalajara. You can find many of these records at FamilySearch and or at the Archives of each particular Archdioses. Each province contains several Diocese under it. The diocese made sure that churches under them always had a priest in order to provide the rites to its communities. Also, the bishop was in charge of approving any marriage dispensations and thus some of these records may be found there. Some dioceses also have their own archives. Anything for Texas you will find it in the Catholic Archives of Texas in Austin. Each diocese also had several parishes under it. Parishes were in charge of baptizing, marrying, and burying their members and records were created for each f these occasions. They also created marriage investigations when one was required. Here is also a great map. By now I am sure that your head is spinning on all the possibilities for your research, but before you go off and have some fun, here are some examples of my own research. My family comes from a small town in Mexico called El Arcabuz. From very young age I knew that it was under the jurisdiction of the Municipality of Miguel Aleman, Tamaulipas. 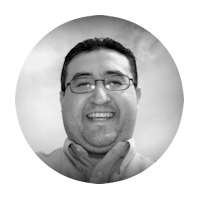 When I started to research my ancestors, I thought that I was going to find everything at the Civil Registration Office in Miguel Aleman. So I go in person, keep in mind I am brand new to genealogy and researching, I asked for names and they could not find anything in their Civil Registration Books. I asked for their local archives and they did not have much. It also did not help that the person helping me was about my age. Finally, he offered to show me some maps, all of which were made about ten years prior. So I gave up. The following weekend I visited my dad and told him about my search. He laughed and told me that Miguel Aleman had nothing on our family. He told me to look in Arcabuz since that is where he was registered when he was born. He also told me that Miguel Aleman is a new municipality barely created in the 1950’s and that Arcabuz used to belong to Ciudad Mier. The following map in its entirety shows the municipality of Mier and the territory it encompassed from the very beginning until the 1950’s. In the 1950’s the Municipality of Miguel Aleman was created and half of Mier was used to create it. The red line in the map shows the partition. Knowing the locality, history, and jurisdictions are vital to finding records. Here is what I have learned from researching the political jurisdictions of Arcabuz. 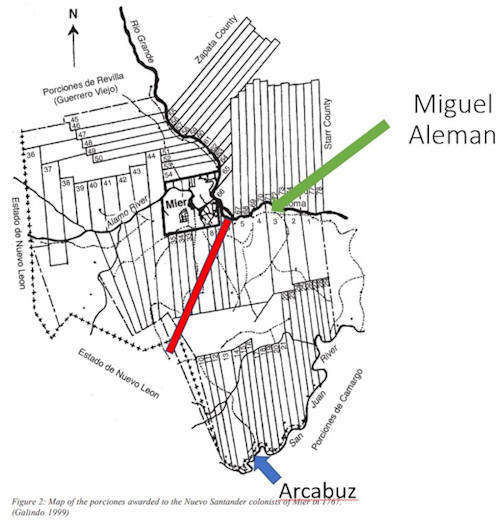 Arcabuz has a Civil Registration Office that registers half of the Municipality of Miguel Aleman after 1953. From 1925 to 1953 Arcabuz Civil Registration Office recorded vital records for 1/3 of the Municipality of Mier. Prior to 1925 all vital records are found in Mier. The State Archives in Ciudad Victoria has records on Arcabuz. The State of Nuevo Leon is south to Arcabuz, so vital records can be found in Los Aldamas and Doctor Coss. The State Archives of Neuvo Leon has records that Mention Arcabuz. The founder of Arcabuz married in Camargo, before obtaining his land grant in 1769. On the above map note that the land above the Rio Grande now belongs to Texas. So anything after 1848 you need to look for it in Starr County. Anything prior you need to look for it in Mier. Civil Registration records can be found only by browsing FamilySearch. They are searchable at Ancestry. Ok, now let me talk to you about my example with church political jurisditions. Just as government jurisdictions change so do the church ones. When I started to do genealogy back in 1998, yes it has been that long. I had no idea that my ancestors were Catholic since I was not raised as a Catholic. So I had no idea that my ancestors had baptisms and I just thought that people got married through the Civil Registration Office and that the same case was for burials. One day I asked my dad as to why my grandparents, his parents, never went to our church. He answered by saying that his parents are Catholic. I told him, But there is not a Catholic Church near the ranch. He then said that was because they belonged to the Catholic Church in Los Aldamas, Nuevo Leon. He also said that even though they would not attend often they always sent their “Diesmo” with a cousin of my grandfather. This conversation provided me with the clues as to where to look for church records of my ancestors but I was soon disappointed that there were no records online for the church of Los Aldamas. After researching, reading books, and attending presentations this is what I have learned about Church jurisdictions in regards to Arcabuz. All church records can be found in Mier and or Los Aldamas for Arcabuz depending on the time period you are looking for. 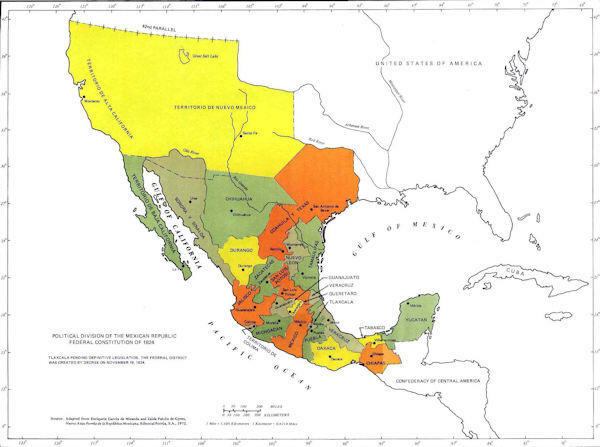 Marriage dispensations for this area prior to 1779 can be found in Guadalajara church records. What is now Los Aldamas used to be under the PArish of Cerralvo so some marriages of people from Arcabuz can be found there. No matter the time period search both Los Aldamas and Mier since some families never settled in registering in Los Aldamas. Church records for Mier can be found on FamilySearch. Some are online available for Los Aldamas but many of the Church records have not been digitized nor are available at FamilySearch. 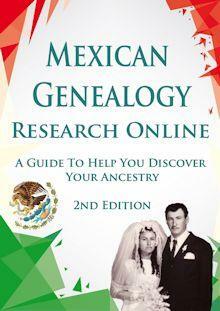 These can be consulted at the local church or at the Archivos del Obispado in Monterrey. I truly hope that you have found this article useful and has provided you with great resources to help you research your ancestors. Please take the time to share it on social media so more people can read it. Thanks in advance. Since the root of my family is from present state of Nuevo Leon this will help to find, I hope, missing documents. Guadalupe, thank you for taking the time to read this post and I truly hope that it helps you out on your research.